Each box contains 6 decks. Each deck contains 53 cards. The Cardfight Vanguard: Ren Suzugamori Trial Deck features the Shadow Paladin clan used by Team Asteroid's leader, Ren Suzugamori! Each box contains 6 decks. Each deck includes 50 cards, a first guide, a play mat, and 3 Gift Markers. 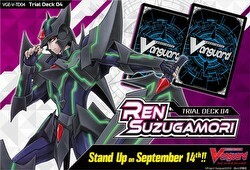 Each deck includes 4 copies of Trial Deck exclusive cards such as "The Dark Dictator" and "Blaster Dark"! A "Blaster Dark" with Akira Ito's hot-stamped signature will be inserted randomly in decks! A Gift Marker with RRR treatment and Akira Ito's signature will be inserted randomly too!